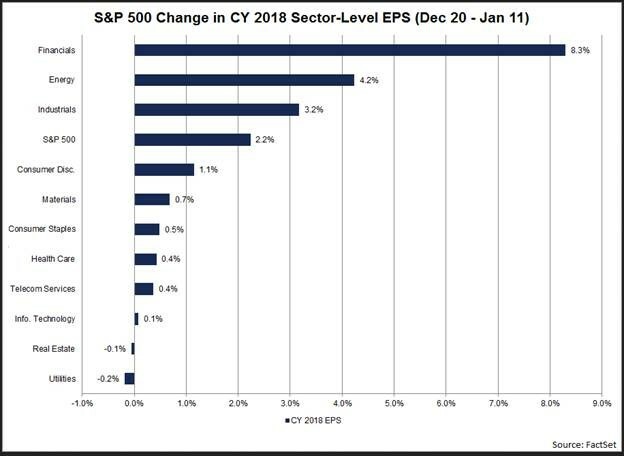 1..Earnings Growth in Sectors Post Tax Cut. 2. 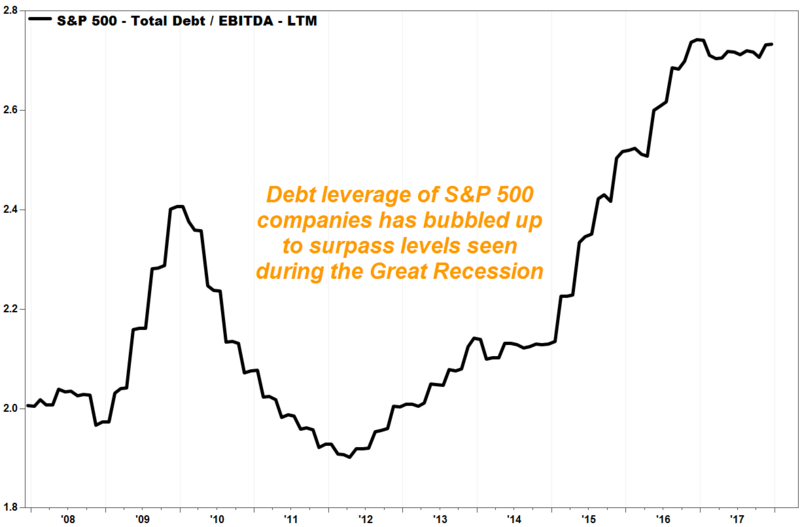 Corporate Debt Levels Rise Above 2001 Records. Why does that matter to the stock market? 4.The Supply of U.S. Treasuries will Double in 2018. Because of the rising government budget deficit and the Fed running down their balance sheet the supply of US Treasuries will almost double to $1trn in 2018, see chart below. 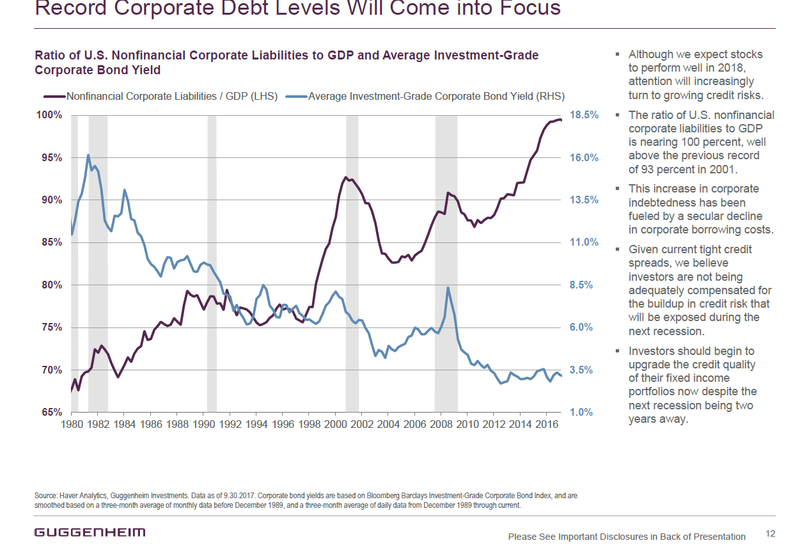 Similarly, the amount of IG and HY bonds maturing is also rising. And the numbers get even worse in 2019. 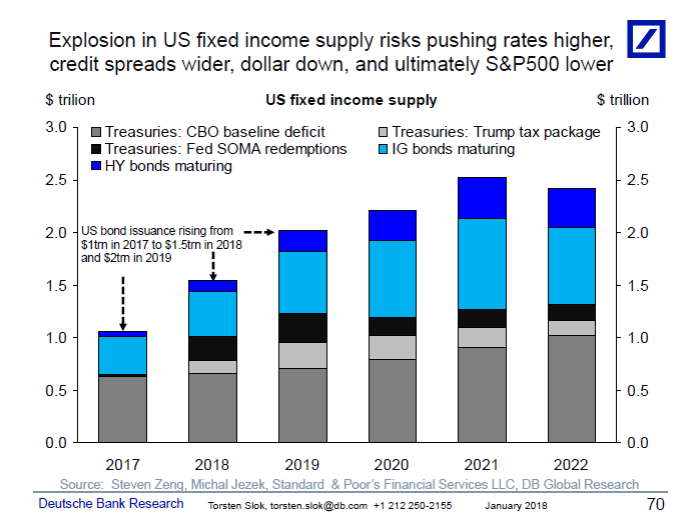 The dramatic increase in US fixed income supply in 2018 is a significant risk to markets. And shrinking global demand as a result of ECB exiting QE in September is not helpful. If demand for US fixed income doesn’t double over the coming years then US long rates will move higher, credit spreads will widen, the dollar will fall, and stocks will likely go down as foreigners move out of depreciating US assets. 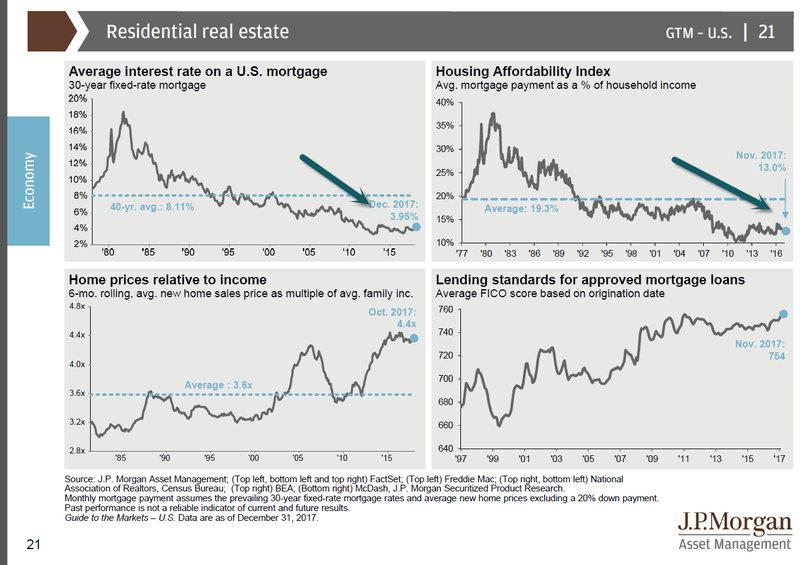 And this could happen even in a situation where US economic fundamentals remain solid. The bottom line is that investors should spend less time looking at US economic fundamentals and more time on where a doubling in demand for US fixed income can come from, in particular in a world where central banks at the same time stop doing QE. 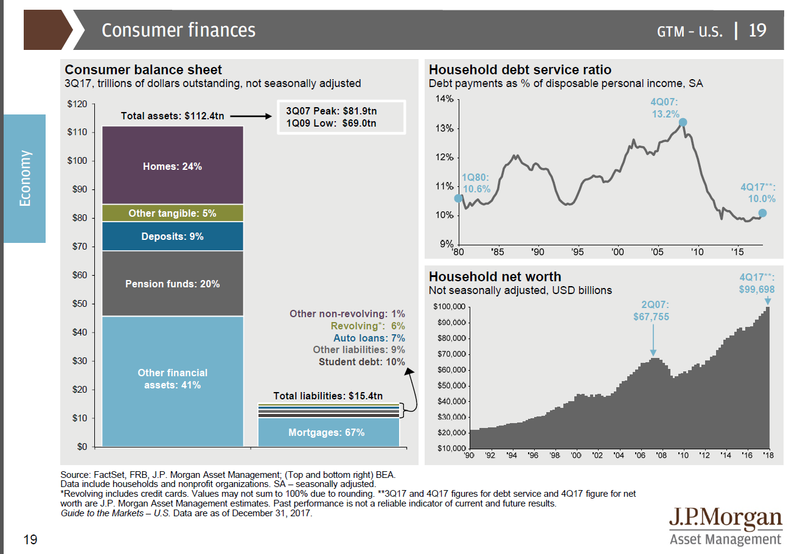 5.Consumer Debt….Debt Service Ratio Very Low. The exuberance in the US stock market of late may or may not be irrational, but the party atmosphere in the value corner of equities (companies that are inexpensively priced) is subdued vs. the celebratory surge for growth shares (firms expected to grow at above market rates). Although both measures of US companies in the large-cap space are posting solid gains, the gap in favor of growth has become conspicuously wide lately. Consider how rolling one-year returns stack up. As of last week’s close (Jan. 12), the Russell 1000 Growth Index was ahead by a strong 33.4% vs. the year-earlier prices (based on 252-trading day results). 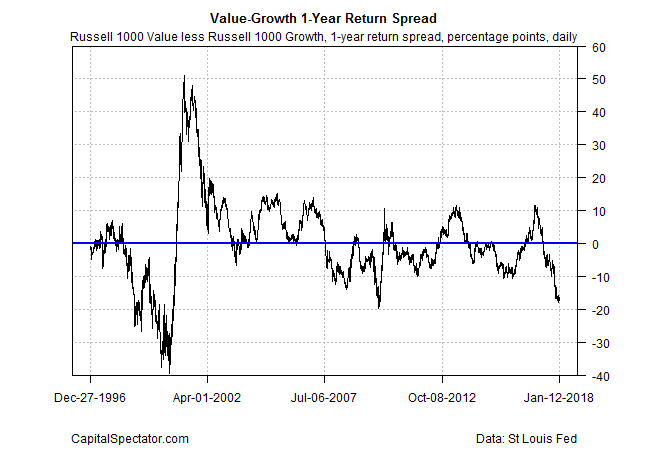 That’s roughly double the 16.7% increase for the Russell 1000 Value Index. In other words, value is in the hole by nearly 17 percentage points compared with its growth counterpart – the deepest setback for value on this front since late-2009. 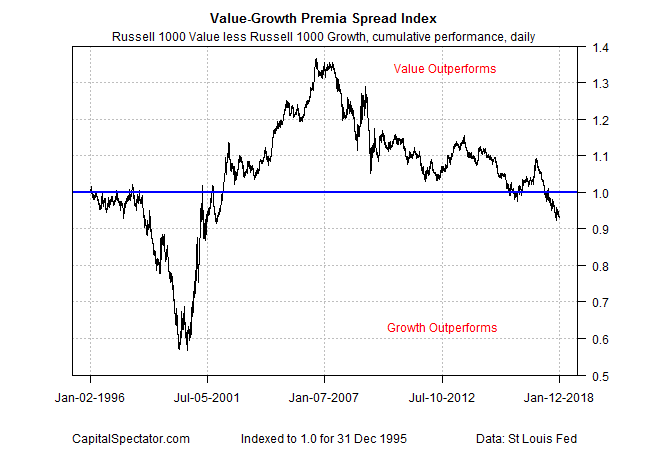 For another perspective on performance, the next chart tracks the daily return spread for Russell Value less Russell Growth, indexed to 1.0 at 1995’s close. When the index rises, value’s relative strength dominates, and vice versa. But as you can see, value stocks have fallen on hard times recently, according to this relative performance benchmark: the daily spread index is currently near a 17-year low. 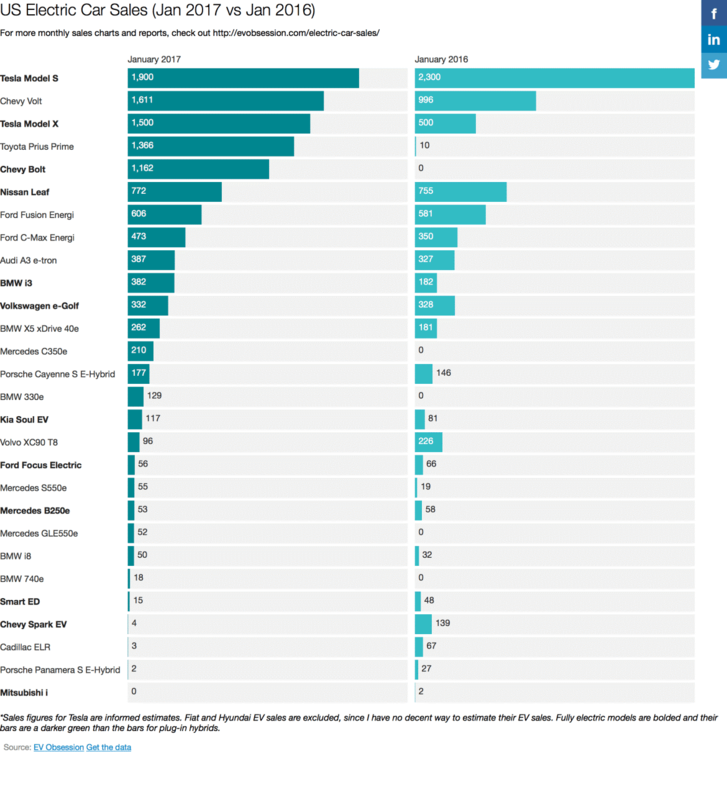 7.Tesla Will Have Tons of Competition in the Future. The announcement came as something of a surprise because Infiniti had previously signaled its intent to migrate to another breakthrough technology, the VC-T engine. More formally known as the Variable-Compression Turbo engine, it is the first mass-production powertrain that can adjust its compression ratio — anywhere from 8:1 to 14:1 — to yield the best balance between performance, fuel economy and emissions. It appears that new engine will be used in the near term but eventually phased out. The engine recently debuted in the new QX50 crossover and will continue to be phased into other Infiniti models — at least until Infiniti apparently phases it out in favor of new battery-based technology. That will include two different approaches to electrification, Saikawa said, including pure battery-electric models like the second-generation Leaf that the Nissan brand is just getting ready to roll into global showrooms. Infiniti had actually scrubbed a plan to market a more upscale version of the first-generation Leaf early in the decade because it didn’t offer the level of refinement, range or performance that they believed luxury buyers would demand. 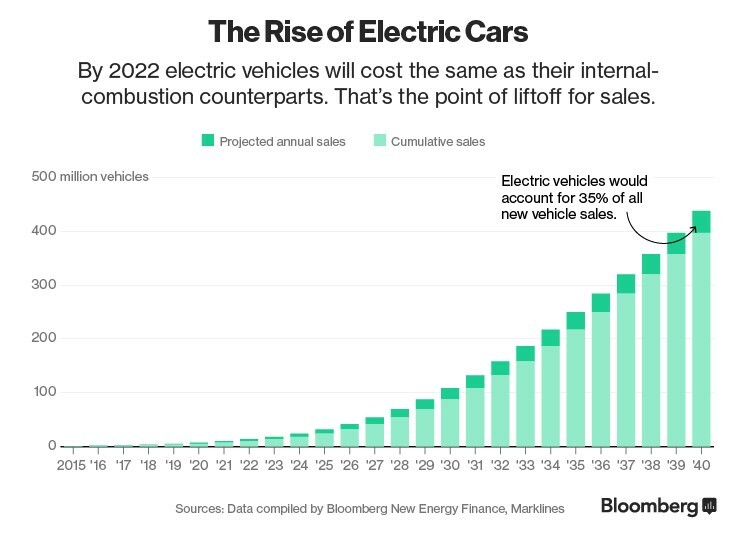 The latest versions of the technology offers significantly longer range and much improved refinement and performance — while battery costs have also plunged dramatically. Millennials are often blamed for whatever ails the economy. We hear over and over again that millennials aren’t contributing to the economy because they are unemployed or they aren’t buying homes or cars and they are delaying marriage and kids. We also hear they aren’t saving money, they are saddled with debt, and on top of all that — they are lazy and entitled. An 85-page report by Mizuho Securities sheds new light on this demographic, however, and argues that some of those assumptions are patently wrong. Millennials do most of their shopping in physical stores. Sure, they are tech savvy and frequently shop online. But millennials haven’t completely abandoned stores and shopping malls. They like to touch and feel products before they buy them, and still appreciate the experience of shopping in a store. In fact, millennials still complete 54% of shopping in physical stores, according to the report. Millennials save more money than the national average.“Contrary to popular rhetoric regarding a highly challenged consumer who may be burdened with debt and living ‘paycheck to paycheck,’ our survey of millennials suggests the majority of the demographic (74% of total responses) saves money every month compared to 26% who do not,” the report says. Millennials allocate about 6.7% of their total budget toward a savings plan of some type (401K, IRA, savings account, etc. ), according to the study. That’s above the US national savings rate of 5.5% per the Federal Reserve Bank of St. Louis. Millennials are planning to buy homes. 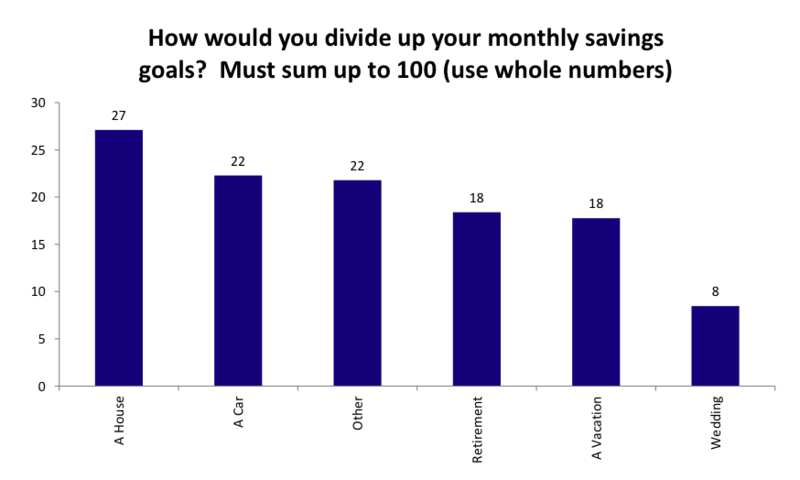 They are delaying home-buying and marriage and kids, but they are planning to get to those life milestones eventually.When asked what they are saving for, millennials said (1) a house, (2) a car, and (3) retirement. Millennials aren’t just relying on Uber and Lyft to get around. They are actually buying cars. Like with homeownership, many millennials have delayed purchasing cars. But car buying among this demographic is rapidly rising and will continue to grow, according to the report. About 64% of millennials plan to buy a car in the next two years, and most of those who don’t plan to buy a car already own one, according to the data. Only 5% of respondents said car-sharing services like Uber and Lyft serve as a replacement for owning a car. 9.Read of the Day…It’s a New World Order—Passive Has So Much Money, They are Making Demands from Corporate Leadership. On Tuesday, the chief executives of the world’s largest public companies will be receiving a letter from one of the most influential investors in the world. And what it says is likely to cause a firestorm in the corner offices of companies everywhere and a debate over social responsibility that stretches from Wall Street to Washington. But for the world’s largest investor to say it aloud — and declare that he plans to hold companies accountable — is a bracing example of the evolution of corporate America. Mr. Fink says he is adding staff to help monitor how companies respond; only time will tell whether BlackRock truly uses his firm’s heft to influence new social initiatives. Companies often talk about contributing to society — sometimes breathlessly — but it is typically written off as a marketing gimmick aimed at raising profits or appeasing regulators. When you’re busy taking care of business, it can easily take you for a ride. You know you’re on this ride when you become very reactive—constantly putting out fires and responding to whichever customer or product is screaming loudest for your attention. This is how most people are when they come to me for help. they’re so caught up in the day-to-day doing that they’ve lost sight of where they’re going. When I go surfing, it’s tempting to jump on the first wave that comes along. If I do, I may well get a half-decent ride. But if I can wait a few more seconds there will often be a better-shaped wave just behind it. Riding the better wave will be more satisfying, and take me closer to where I want to be as a surfer. Worse, you’ll be missing opportunities that can take your business where you want it to go. This is why planning is important. It allows you to decide what type of opportunities you want so you can recognize them when they arrive. Planning also gives you the space and time you need to give these opportunities your all when they arise. If your business were about to crash to the ground and you could only execute one idea, what would it be? I’d recommend starting with whatever’s working for you already. That’s easy to say, but harder to do. Why? Because most entrepreneurial types find it hard to execute ‘just one idea’. They have a million in their head at any one time, and keep adding to them by the day. Those ideas create a lot of noise, clog up the brain’s processing capacity, and provide an easy avenue for distraction. Escape from boredom is a serious enemy of focus. When I was in my late ’20s, it felt like my brain was always so full of information I needed to clear it. I found that a pen, some paper, and a bit of quiet time at the breakfast table was a great way to purge all of that information. Purging those ideas doesn’t mean getting rid of them forever, or saying you’ll never pursue them. You’re simply getting them out of your head for now. Using a whiteboard or a big sheet of paper, write down everything that’s on your mind. Don’t stop until you can’t think of anything else to write. Take a photo of your whiteboard or piece of paper and file it away for safekeeping. See if you can delete or cross out any items that aren’t worth worrying about—ever. Score the remaining items according to their impact (i.e. 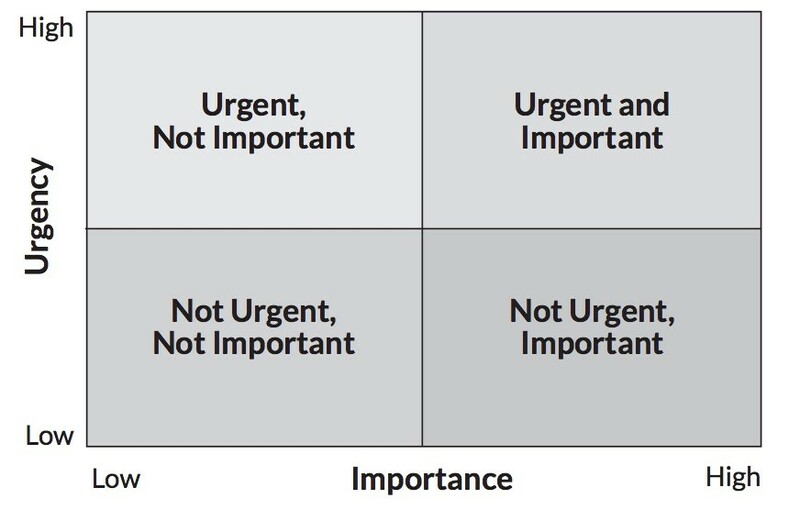 how important or urgent they are to your mission). Circle the top three items that must remain in your sphere of focus, and transfer them (in order of importance) to your daily action pad, a Post-It note on your workspace, your refrigerator, or whatever. You can now safely clean the whiteboard, or tear up/shred/bin that piece of paper. And with your head now freed from all those ideas, you can start thinking about where you want to go. I often see people go to event after event after event. Webinar after webinar after webinar. Course after course after course. And two years later, all they’ve achieved is having attended those things. All that attending, consuming, and buying means they’re burning up so much energy they never implement or execute anything. In fact, they become so overloaded they don’t even know where to start. This is where I find the railway metaphor useful. Imagine you’re at Grand Central Station, and you want to get somewhere. Maybe that “somewhere” is starting a new business. Or achieving a significant profit change for your existing business. You may want to build a few days off into your weekly schedule, travel somewhere exciting, or have time to develop a new skill such as cooking. Whatever it is, close your eyes and really imagine it. Walk around in your future reality. Take in the sights, sounds, smells, tastes, and textures. Get intimate with the idea. Next, make sure you’re happy with it. Are you happy with the constraints that come with this future reality? Do you know someone else experiencing that kind of reality? What kind of life do they have? Do you want that life? Are you prepared to pay the price and do whatever it takes to create this future reality? Remember, very little ever comes without effort or input. You will need to expend energy to get results. Now that you know where you want to go, and what it might be like, you can lay down tracks along the easiest and most direct path to the next station. Planning is important. It allows you to decide what type of opportunities you want so you can recognize them when they arrive. Planning also gives you the space and time you need to give these opportunities your all when they arise. Often, I see people set the goals for their plan and then kind of stop. It’s as if they believe they can achieve their goals simply by having them. Going back to the train and tracks metaphor, knowing where you want to go won’t actually get you there. You need to both lay down some tracks and then roll your train along those tracks. To “have time” for these activities, we must make time for them. A powerful way to do it is to block out the time in our calendars. We’re effectively “paying” ourselves by reserving the time we need before others have a chance to take it. Deadlines are also useful for ensuring you get things done. Parkinson’s Law states that “work expands to fill the time available for its completion.” Therefore, having lots of short deadlines to focus on high-impact activities will increase the effectiveness of what you do. When I set the date for a live event, that’s a deadline. I have no choice but to have everything organized for that date. It’s the same if you’re traveling to another country. The flight is booked for a specific date, and you need to get packed and to the airport with your passport and all the documents you need before the plane takes off. I do regular training calls in my coaching programs that involve me sharing specific insights. That’s a deadline. When people expect you to show up, you make things happen. In my highest-level coaching community, I check in with my students once a week on a group call. That weekly tune-up is fantastic because we can really plot what they’re doing well, and where they’re getting great results. And seeing each other setting goals and deadlines, and getting things done, encourages them all. Having 40 to 50 check-ins a year is far more effective than having two or three live events where people fly in, spend a day or two talking about their business, then disappear and get sucked back into life. These frequent check-ins force you to re-visit your progress as you move along the tracks. If you’re straying, you can quickly get back “on track.” And by measuring and plotting your progress, you’ll know you’re taking the most direct route. So make sure you set a weekly calendar reminder to check your progress. The third layer of planning is having a major review point every 12 weeks. These reviews are like stations you can stop at along the way. They’re milestones where you can celebrate your success, and use as motivation to keep you moving forward to your ultimate destination. You can also check whether your original plan still makes sense, and clarify what the next station looks like so you can lay the tracks to get there. It’s important to limit the “distance” between each station to 12 weeks. People often make a plan and then give themselves a year to execute it. When do they do all their execution? Usually in the final month, if not the final weekend. Parkinson’s Law in action. Shortening timelines forces you to be direct, and removes a lot of the “analysis paralysis” that can stop perfectionist types in their … well, tracks. If you want a visual incentive, chart your progress by coloring in a bar graph or using magnets on a whiteboard. Fun fact: In my first year as a sales professional selling BMWs, I’d stick a magnetic Troll Doll on the refrigerator for every car I sold each month. As my skills improved, I had to buy more troll dolls. My system was highly visual and quite fun. Creating solid systems around planning and goal-setting is essential. The systems keep you honest and, most importantly, let you closely track the metrics that are important to you (which for this book is your EHR). Clear your brain. Purge everything from your mind, delete anything that won’t have an impact, score the highest impact ones, and transfer the top three. File the rest away somewhere safe. Then forget about them (for now). Figure out your destination: identify your ideal future reality. Lay down the tracks: figure out the steps that will take you to your destination. Create stations along the way at 12-week intervals. These milestones will provide the momentum to keep going. Block out time in your schedule to execute the plan. Set an alert to check your progress weekly. Create a 12-weekly review point.